Update: This article is also published on CircleID. Last month, John Klensin wrote an article published on CircleID regarding Internationalized Domain Names (IDN) Top Level Domains (TLD). Based on his Internet Draft, John suggests using language translation in the application for TLD. The advantage of this method is that all existing TLDs can now be represented in any number of languages without additional need for ICANN to create new TLD. Today is the 2nd day of APEC TEL 30, which is hosted by IDA in Singapore. I spend my afternoon at a side event, organized by APDIP to soliciate feedbacks from AP region on Internet Governance issues as part of the WSIS process workings towards Tunis 2005. I just left NIDA stealing some of the IP packets :-) While there, I bounced in Dongman Lee and Chanki Park. Park is an old friend who is currently the manager in charged of the .KR domain names registry and we have a brief chat about Korean domain names. Apparently, they have over 80,000 thousand korean domain name registrations (wow! that’s more then the whole of .SG) but Park expect that the numbers will be going down in the next few months. The main reason cited was the lack of support of IDN in Internet Explorer, the pre-dominate browser in Korea. Park suggested that I should pull together a meeting again with Microsoft. I hope the folks at the IEBlog are listening. 1 Don’t get me wrong..Michel is a good friend and I dont meant to embrass him here. But the reasonings for not supporting IDN is plausible 2 years ago but sound very silly now. I feel quite bad to controdiact Vint Cerf in the open forum but my comment that whether to have IDN Top Level Domain is an ICANN issues and not IETF was well-received with an applause from the audience. So I am really glad that ICANN board passing the resolution to form a new President committee on IDN and gave acknowledgement to the RFC 3743 JET Guidelines ;-) I wish we could have more concrete action plan but at least this is a start. I believe we should also try to rope in the Arabic community, particularly those who are doing real work on the ground like GCC. I may not agree with everything they do (like the alt. Arabic root) but I respect them for doing work to move their community forward. I stayed on one more day because Jonanthan from BBC World wants to do an interview with me on IDN issues (in my personal capacity of cos). We end up wandering various part of Chinatown in KL looking for interesting location shots. It is suppose to be shown 2 weeks from now and I wonder how it will look like…too bad I dont subscribe to cable. Incidently, the corridors conversations, bar and dinners discussions clearly indicate the recovery of this industry. I feel I am back in the dotcom days with companies investing in new ideas. If the last ICANN is gloomy, this one certainly feel good! 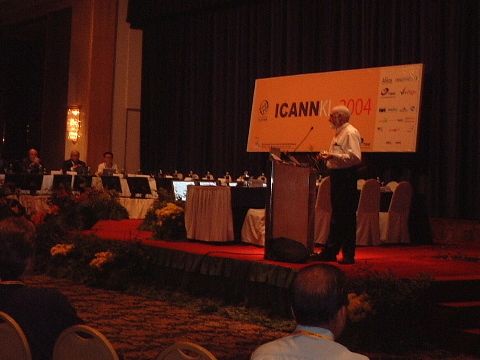 I am back in KL today for the ICANN IDN Workshop. Yes, I am one of the unnamed speaker for the morning session chair’ed by Sharil and Vint Cerf. John Klensin basically took over the stage giving a tutorial of the higher level problem, the Internationalization or more accurately the multilingualism of the Internet. John noted at that this is either a risk or opportunity. Do it well and we will bring Internet to the next stage and do it badly, we risk fragmentation of the Internet. I was asked to give a tutorial on the IDN standard but really, IDN is only a small piece of the bigger picture. The afternoon was more of series of presentations of updates from different countries and experiences of IDN deploymnet. I gave a presentations on the JET Guideline in this session. Interesting stuff in this session includes (1) Japan is getting their mobile browsers to support IDN (2) Korea domain names registration shot up t0 70k almost overnight (3) Verisign already migrated their IDN registrations to standards. I am in Kuala Lumpur this wekend to give an overview of IDN to Government Advisory Committee of ICANN. Anyway, on the way back to Singapore now but will be coming back again on Tuesday…See you all at the IDN Workshop on Wednesday. WTF!? 6M USD for MINC? According to the article from Reuters (via Internet Policy), Khaled Fattal of MINC is asking 6M USD to solve the Arabic Domain Names. I was one of founding member of MINC. The original vision is to have an organization that can help faciliate and resolve the language issues with IDN that will not be tackled by the IETF IDN-WG. But after been hijacked by certain commerical interests, and then hijack again and again, I stayed away from them as far as I can. It is difficult to explain RFC 3743 or commonly known as the Joint Engineering Team (JET) Guidelines without some lesson on Chinese, Japanese and Korean (CJK), particularly how it relates to Internationalized Domain Names (IDN). Luckily, an Internet-Draft [PDF] we wrote back in 2001 discusses the issues quite neatly in this context. In brief, Chinese characters (Hanzi) or Han ideographs are evolved from pictographs (writing made up of pictures) across thousands of years. Unlike other writing systems, Han Ideographs are constantly evolving. In the 1950s, China underwent a major exercise to simplify the Chinese writing using an almost systematic process. The resulting simplified form or Simplified Chinese is now being used in China and Singapore while the original form or Traditional Chinese is still being used in Taiwan, Hong Kong, Malaysia and most oversea Chinese communities. Because of the almost systematic simplification process, there is a somewhat 1-to-1 matching between Simplified Chinese and Traditional Chinese. It is easy to associate it to the like of uppercase/lowercase in English but at best, it is a bad analogy that grossly underestimates the depth of the problem. If that is not complicated enough, Han Ideographs are also used to write Japanese (Kanji), Korean (Hanja) and old Vietnamese (Chu Han and Chu Nom), and each language has its own simplification history and rule. In addition, there are many Han Ideographs that look exactly the same (CJK Compatibility) or have similar looks (zVariants) but assigned different code points in Unicode.